Het kwam inderdaad 14 dec. 2014 uit en is inmiddels op books.google in te zien. This book analyzes three often-debated questions of Spinoza's legacy: Was Spinoza a religious thinker? How should we understand Spinoza's mind-body doctrine? What meaning can be given to Spinoza's notions – such as salvation, beatitude, and freedom – which are seemingly incompatible with his determinism, his secularism, and his critique of religion. 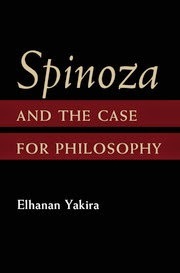 Through a close reading of often-overlooked sections from Spinoza's Ethics, Elhanan Yakira argues that these seemingly conflicting elements are indeed compatible, despite Spinoza's iconoclastic meanings. 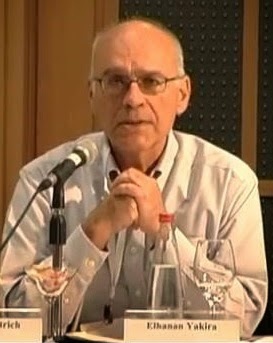 Yakira argues that Ethics is an attempt at providing a purely philosophical – as opposed to theological – foundation for the theory of value and normativity. • Offers a comprehensive interpretation of one of the most difficult and least studied parts of Ethics: the second section of the fifth part. Kortom, het belooft nogal wat! Toevoeging: cf. review door Alexander Douglas in blog van 14 aug.2015: "Elhanan Yakira’s "extremely opaque" Spinoza-boek"